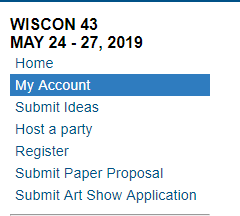 The time to WisCon 43 is approaching, and we believe it’s important to keep the community updated, so let’s get it started off right! 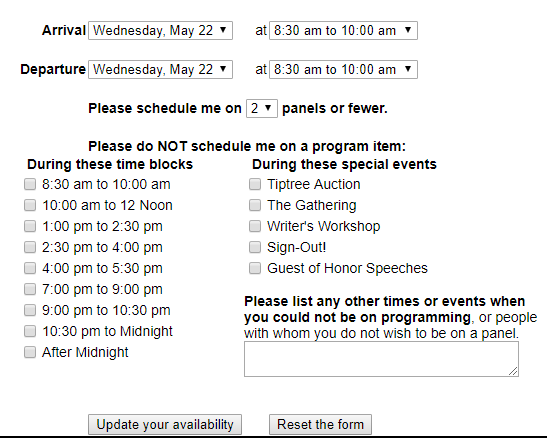 Panel Programming wants to help you get the best WisCon panel programming experience, so after you register, we would like for you to do a couple of things. 1. Update your profile, especially your email address. All you need to do is log in to your profile, click the “Edit” link on the right side of your name, then click on “Save” once you’re done. In this text, you will be asked for your arrival/departure information, your desired number of panels, as well as your preferred panel times. Once again, the more information you provide us, the better it will be for you. Given that it is early, you can start off with a ballpark estimate, but please update as we get closer to the availability deadline in 2019. 3. Submissions for Panel Programming are open! Please be sure to submit your proposal to the correct department. If you log into your profile, you will see a list of different options where you can submit your program idea to the right department on the left-hand side of the screen. Please see the screenshot below for an example. If you want to submit a panel idea, please click on the “Submit Ideas” option. If you want to submit a party, please click on the “Host a party” option. If you want to submit a paper proposal/academic proposal, please click on the “Submit Paper Proposal” option. Panel Programming asks that you please use the correct option for submitting your program idea. If you submit an event to us that is not a panel, due to the volume of panel requests and the subsequent organization of the panel schedule, we cannot guarantee that your submission will be timely transferred to the correct department. The deadline to submit a panel idea to Panel Programming is January 21, 2019. As we get closer to WisCon 43, Panel Programming will regularly update the community of its various deadlines. We are excited to kick off planning for WC43. As usual, if you have any questions regarding Panels, please email us at panels@wiscon.net. This Just In: WisCon 42 Panel Sign-Up and Interest Survey Opens on February 26!